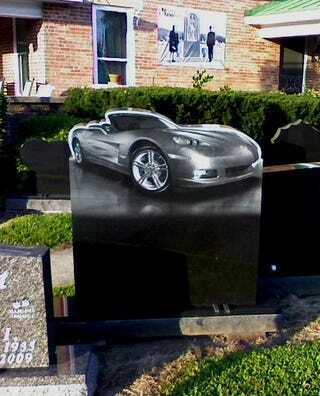 A headstone maker in Brookville, Indiana's got a special headstone for the 'Vette owner who's got everything — except a beating heart. I spotted this near Brookville, Indiana over the weekend, scaring the wife half to death when I pointed and yelled "CORVETTOMBSTONE!!" as we passed a small monument business. This is in Indiana, so I guess it isn't too surprising that the car etched in granite (yes, it is definitely etched, wished I'd taken a close-up) is an Indy 500 Pace Car C6 convertible. In case Indiana is too far a schlep for you to pick up your copy of the Corvette headstone, we've hunted down the press image they used, so you can get your own made.